TemplateHack.com - Download Foodlicious premium blogger template. Are you searching for best food blogger template to promote your cake homemade business, restaurant business, or just to share your secret recipes? Download Foodlicious blogger template. This template made for food niche bloggeer topic. With amazing cusomizable typography, your blog will look more elegancy after applied this template. 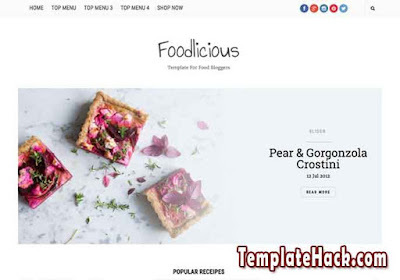 If you want to try this template, follow this steps to get free premium Foodlicious blgospot theme. Breadcrumbs, Browser Compatibility, Customizable, Drop Down Menu, Fast Loading, Featured Post, HTML5 Valid, Mobile Friendly, Post Thumbnails, Responsive, SEO Friendly, Social Bookmark Ready, Social Share Button, Typograhpy, Whatsapp Sharing Button, Clean, 1 Right Sidebar, white, 2 Columns, 3 Columns Footer. Business blogger template, Daily Blog blogger template, Fashion blogger template, Film blogger template, Food blogger template, Gallery blogger template, Health blogger template, Lifestyle blogger template, Movie blogger template, Personal blogger template, Photo blogger template, Photography blogger template, Portal blogger template, Profile blogger template, Recipes blogger template, Reviews blogger template, Viral blogger template.